Join Us In Tracking Spring Timing! 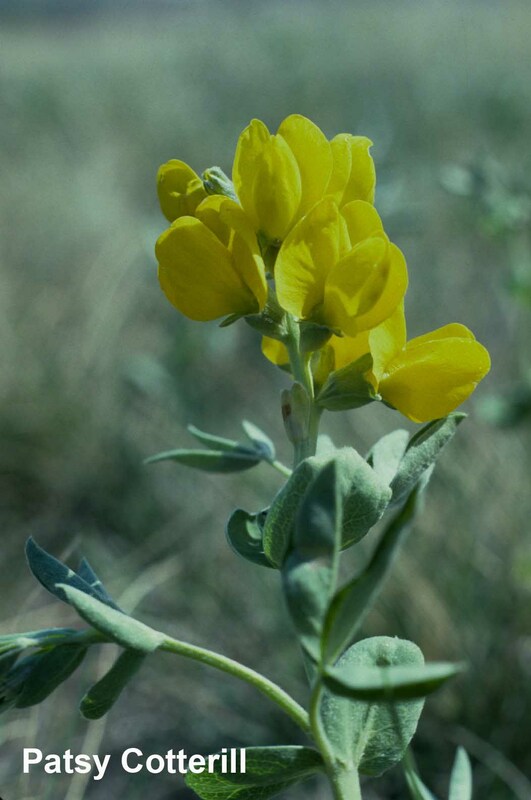 Thermopsis rhombifolia – The name ‘buffalo bean’ shows us the First Nations Peoples’ knowledge of phenology. They used its flowering time to indicate that buffalo bulls were ready for the spring hunt. A wildflower (or herb), 15 cm to 50 cm tall, usually growing in large patches.The fat stalk is covered with downy hairs when it emerges from the ground. Soon the stalk straightens to a spike. Leaves: Leaves are dark green with 3 leaflets, each rounded leaflet 2 cm to 3 cm long. 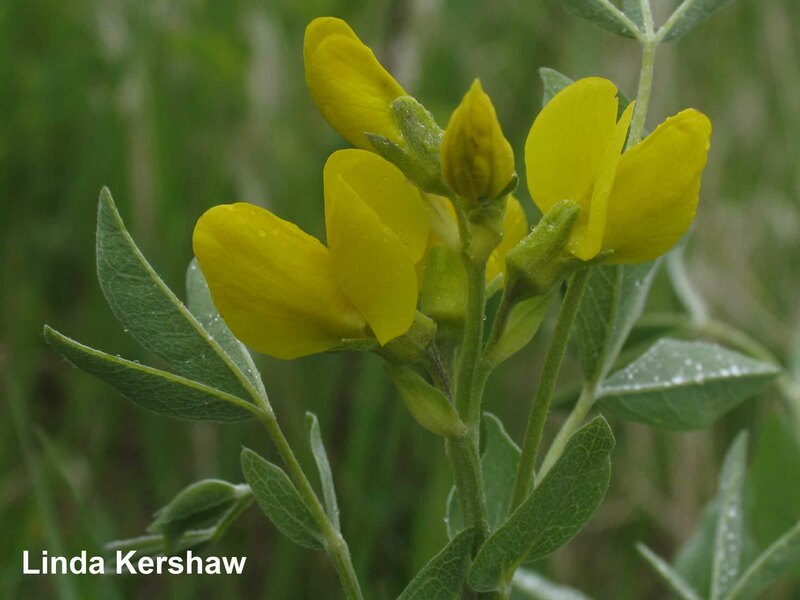 Flowers: Flowers are bright yellow, each 12 mm across, and together form a dense cluster.They resemble the flowers of a pea. Fruit: A grayish-brown, hairy, curved pod, about 5 cm long with 4 to 6 seeds. Warning: DO NOT eat the “beans” or any other part of this plant. Golden bean contains poisonous alkaloids that may cause children to become very ill and is suspected of causing death in livestock. Alberta: Southern Alberta, extending north to Edmonton and west to Drayton Valley. Canada: Its range is limited in Canada, found in southern Alberta and Saskatchewan. It is also located in the southeast tip of British Columbia and the southwest tip of Manitoba. 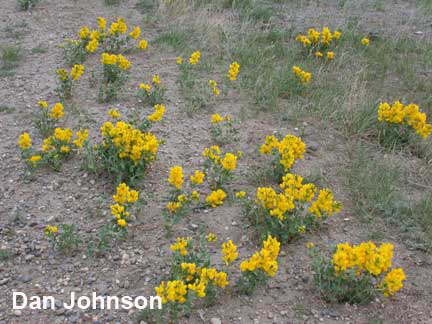 Golden bean plants can be found in open sandy areas in prairie and aspen forest where the water table is high. If the plants are very abundant, mark a plot about one metre by one metre in size. First bloom: When the first flowers are open in the patch observed. Mid bloom: When approximately half (50%) of the flowers on the plants under observation are open. When does this plant bloom? Flowers in mid to late May or early June. Golden bean grows up each spring from a rhizome. This plant is unpalatable, and therefore is not grazed upon by livestock or wildlife. This plant benefits from a partnership with fungi and bacteria in the soil; the fungus provides minerals and the bacteria take nitrogen from the air and enrich the soil. 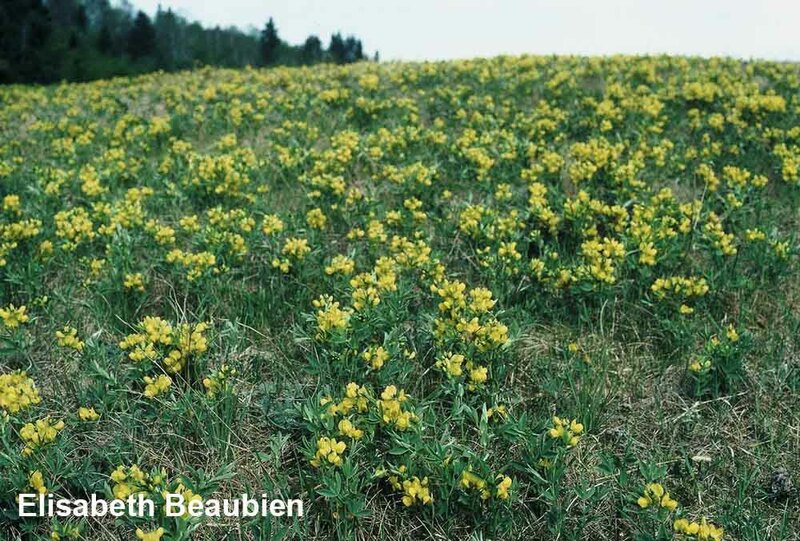 The buffalo bean is a plant of the prairies, but for some time it has been spreading northwards in the sandy areas of the parkland region via railroad embankments and roadsides. A small brown butterfly with light markings called the Afranius duskywing (Erynnis afranius) uses the golden bean as a nectar source. The duskywing’s caterpillars also use the plant as a food source. If you see a pale green caterpillar with a dark stripe on it’s back and a black green head nibbling on golden bean, you are probably looking at an Afranius duskywing. Another butterfly, the Christina Sulphur (Colia Christina Christina) has been observed laying eggs on the golden bean plants. Like their name, Christina Sulphurs are coloured yellow to orange (females may be paler or white), with pink wing fringes. Plants such as Golden Bean belong to the family Leguminoseae and provide both nectar and pollen for bees (flowers of some other species provide only one or the other). Sometimes a bee will take only nectar from one flower and pollen from the next. Bees are able to collect the pollen using specialized “brushes” on their abdomens that brush against the flowers. Flowers mid to late May or early June. The name ‘buffalo bean’ shows us the First nations Peoples’ knowledge of phenology. They used its flowering time to indicate that buffalo bulls were now ready for the spring hunt. An early blooming plant, with the dandelion it helps to keep fields and sunny slopes of roads and cut-banks predominantly yellow until buttercups and other flowers take over in June. Golden bean flowers were used as a cure for stomach disease. The brew was drunk, causing the person to pass what was bad. The petals were dried and smoked, and the roots were used for a horse medicine. A dye was made from the golden bean flowers, which was used by First Nations People to colour skin bags and arrows. CAUTION: Flowers and seeds (beans in curled pods), which form later, are poisonous and should not be eaten. Because of their toxicity, this plant is not recommended for use in school gardens. Bird, C. D., G. J. Hilchie, N. G. Kondlae, E.M. Pike, and F. H. Sterling. 1995. Alberta Butterflies. Provincial Museum of Alberta. Edmonton, Alberta. Brown, A. 1970. Old Man’s Garden. 2nd edition. Evergreen Press Ltd. Sydney, British Columbia. Cormack, R. G. G. 1977. Wildflowers of Alberta. Hurtig Publishers. Edmonton, Alberta. Kerik, J. 1985. Living with the Land: Use of Plants by the Native People of Alberta. Alberta Culture. Edmonton, Alberta. Marles, Robin J. et al. 2000. Aboriginal plant use in Canada’s Northwest Boreal Forest. Natural Resources Canada. UBC Press. Vancouver, British Columbia. Moss, E. H. 1983. Flora of Alberta. 2nd edition. University of Toronto Press. Toronto, Ontario. Vance, F. R., J. R. Jowsey, and J. S. McLean. 1977. Wildflowers Across the Prairies. Western Producer Prairie Books. Saskatoon, Saskatchewan. Wilkinson, K. 1999. Wildflowers of Alberta: A Guide to Common Wildflowers and Other Herbaceous Plants. University of Alberta Press and Lone Pine Publishing. Edmonton, Alberta.